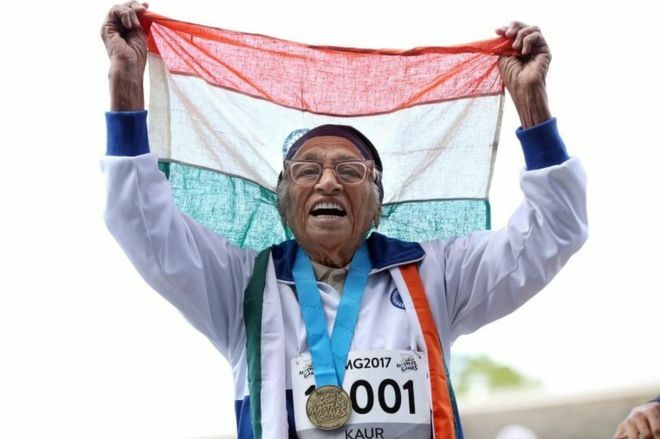 A 101-year-old woman Man Kaur from Chandigarh, Punjab, India, won a 100-metre sprint at the World Masters Games in New Zealand’s Auckland. This is the 17th gold medal in the athlete’s remarkable late-blooming career. The unique international event was organized for athletes over 30. When Kaur joined in that event, athletes felt inspired by her energy and drive to compete. The “Miracle of Chandigarh” finished the race in one minute and 14 seconds, only athlete to complete in the 100 years and over category- ending a mere 64.42 seconds off Usain Bolt’s 100-metre world record set in 2009. After winning the race Man Kaur said that “I enjoyed it and am very, very happy. I am going to run again. I am not going to give up. I will participate in more races. 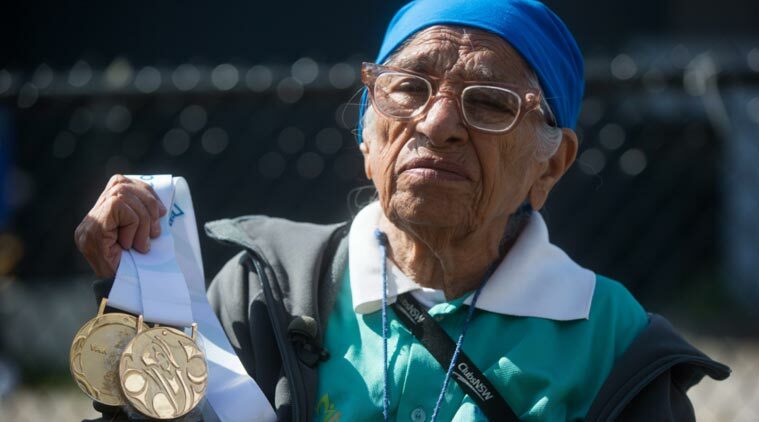 There is no full stop.” Man Kaur had entered the athletics scene at age of 93 with her son Gurdev Singh’s suggestion. Kaur took up athletics eight years ago. She had no prior sporting experience before her son Gurdev Singh suggested she join him in competing on the international master’s games circuit. When she crossed the finish line in Vancouver, her competitors many of them in their 70s and 80s were there to cheer her on. Kaur, who finished the sprint in one minute and twenty-one seconds, raised her hands and smiled as she finished her race. But Man Kaur was guaranteed victory as the only participant in the 100 years and over category at the New Zealand event, which has attracted 25,000 competitors. After a medical check-up she was given the all-clear signal and since then mother and son have taken part in dozens of masters athletics meets around the globe. Man Kaur already has swag of gold medals that would rival Michael Phelps’ haul. She also plans to compete in the 200m sprint, two kilograms shot put and 400 gram javelin in Auckland, taking her tally to 20. Man Kaur has now won more than 20 medals in Masters Games across the globe. While practicing in her home of Chandigarh, she goes out every evening to run five or 10 short distances. When asked to share her secret to long life, Kaur said a good diet and lots of exercise can help one to achieve a long-lasting life. By winning the gold, Man Kaur has become a worldwide inspiration for athletes over 30 who participate in the games. 86 years old Sister Madonna Buder known as the “Iron Nun” because of her prolific triathlon and Ironman career, inspires others with her unwavering optimism and purpose. 65 years old Pat Gallant Charette is a retired nurse, grandmother and former self-described “spectator mom” from Maine. Pat Gallant-Charette has excelled at open water swimming since she took up the sport more than 15 years ago. 75 years old Louis Self’s passion is Kite boarding. Kiteboarding, a sport that combines surfing, wakeboarding and windsurfing, is increasing in popularity. Self has been kite boarding since he turned 58 and can jump over 20-feet off the water. In May 2013 at age 80, this Japanese alpinist became the oldest person to summit the world’s highest mountain. Scaling Mount Everest which is approximately five and a half miles above sea level is no small feat for an athlete of any age. Miura has reached the summit three times in his lifetime all when he was over the age of 70! Dharam Pal Singh, a runner from India who has controversially claims to be the world's oldest marathon runner at 120. His presence would be extraordinary at the World Masters Athletics Championships. He is not only the oldest known runner in the world but probably the oldest man in the world. Not many 77-year olds crank out Crossfit WODs and have one named after them, but Jacinto Bonilla does.